1 Bedroom Flat For Sale in Totnes for Offers in excess of £200,000. 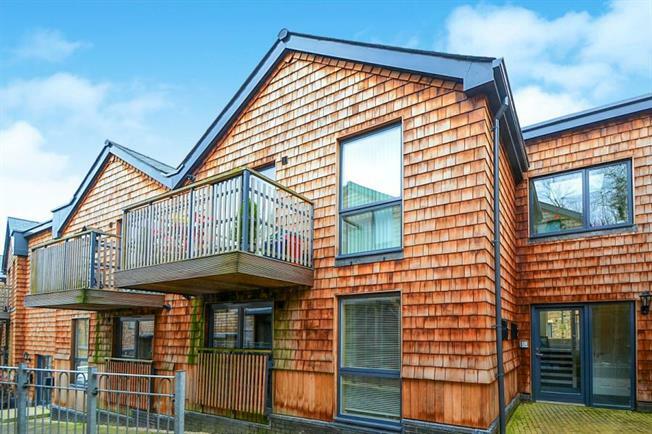 This delightful one bedroom 'Bloor' built apartment epitomises modern day living and is in a great position beside the Quayside and just a short distance from the town centre. Lovely open plan and airy with a contemporary kitchen/diner, spacious lounge and even has the benefit of a garage. A lovely home great for a first time buyer or someone looking for that holiday home experience. Double Glazed picture window to front aspect, radiator, TV point. Range of matching fitted contemporary style wall and base units, silestone countertops, composite one and helf sink unit with built-in silestone drainer, fitted built-in electric over and electric hob, stainless steel chimney style extra hood over, integrated built-in fridge/freezer, slimline dishwasher, washing machine, cupboard housing wall mounted gas boiler, radiator, downlighters, double glazed french doors. Double glazed window, pannelled bath with mixer spray shower unit, pedestal hand basin, low level WC, heated towell rail, part tiled walls, tiled floor, extractor fan.